I tuned my radio to 14.060 MHZ then held my breath while listening in the headphones. Instead of copying Leo, KB7LOC, I heard what sounded like the War of the Worlds soundstage. But what should I expect on this frequency in the middle of the night? My being here was no chance event, but rather the result of carefully laid plans that might never produce a single positive result. Many folks arriving at such desert locations search for stout walking sticks, large water bottles, and perhaps wide-brimmed hats. For us radio people, however, digging-in means configuring VHF and HF radio stations. While Barb doesn’t share my CW enthusiasm, she enjoys two-meter radio and has more than once conducted the local two-meter traffic net when the NCS fails to show. Our adventure began in earnest after purchasing a used fifth-wheel trailer. It came furnished with pots and pans, dishes, and silverware. Located more than a mile from the nearest power grid meant we had top generate our own power. My old Swan 400, still in Oregon, had served me well during the ’91 Gulf War but it was a power hog. The new radio would have to be solid-state. After a day of searching the Internet at the Ajo City Library, I chose an MFJ-9420 transceiver with a CW board. And a G5RV wire antenna from AES in Las Vegas which completed the system. MFJ reviews claimed there is no hotter receiver available. The speech processor on SSB is no slouch either. During the hours of midday sun the output to the coax measured just shy of nine-watts. It was enough signal to fetch sideband QSLs across North America, including Hawaii and Alaska. After sunset the power output reduced to a needles-width greater than five, close enough to qualify for QRP. Then, as though Leo had his ear to ground, Barb copied his message off the National Traffic System. Leo and I both attended tech school at Keesler AFB, Mississippi during 1956 – 1957. After school he went to an early warning radar site atop a Nevada mountain. I went to Charleston AFB, South Carolina. We didn’t meet again until 1991 during the Gulf War while we both served in Oregon Army MARS. The reunion was mind boggling. QRP? Not a problem, I thought. His QTH, Seal Rock, Oregon, some seventeen hundred miles to the north-northwest will be a walk in the park for this little hummer. 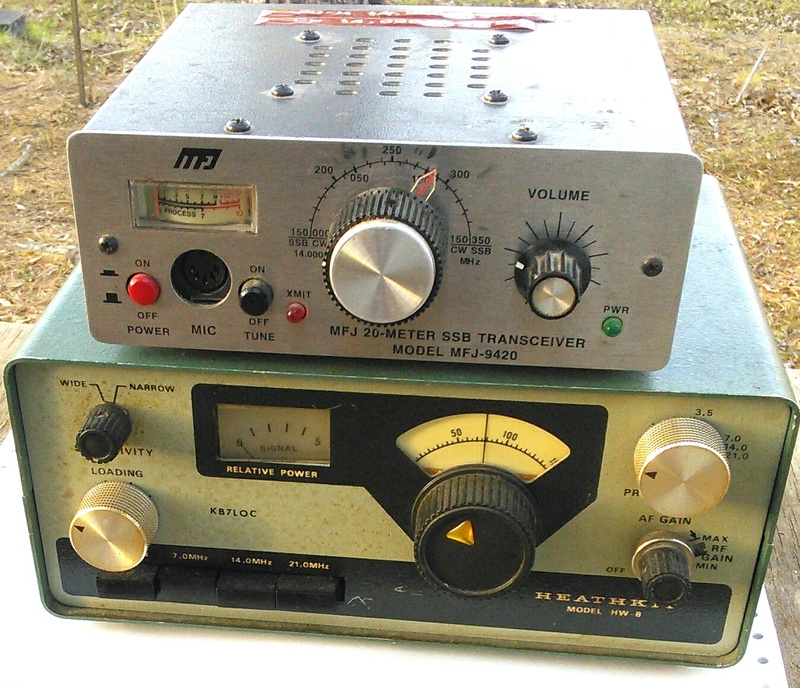 It was QRP the hard way, his one-watt and my five passing in the night. After several Wednesdays the escapade took on a flavor of hopelessness, but we labored on. One night I heard his suffix, a squeaking LOC. His frequency is too high, sounding more like an Irish penny whistle than a Hot Water Eight. Catching my breath, I listen with all the strength I can muster. Then KB7LOC finds its way through the dark. I issued him a signal report of 224. He sent me a 335. Then he’s gone, vanishing into the night like a wisp of cigar smoke. Our third time the band is filled wall-to-wall with atmospheric noises. I’m reminded of a scene in the movie Apocalypses Now. Leo reports my signal as a perfect 599. His signal, however, is heterodyning with another station that’s dead on. The echoes and ringing are reminiscent of a carrier fresh in from the Polar Region. I send him a 221, and I think that is generous. Three contacts were our grand total for the winter of 2000. We should have tried harder for more QSOs. But neither of us foresaw the future.